A document describing how vendors can implement a Rainbow Flag Emoji has today been published. This document, written by Mark Davis and the Unicode Emoji Subcommittee, details a sequence that vendors can use to support a pride flag emoji on their systems without waiting until 2017 for Unicode 10.0. The Emoji subcommittee decided that although the rainbow flag is related to gender, it would be cleaner if it were described in a separate, smaller, document. The rainbow flag features in the Emojipedia Top 30 requests, and has been requested of Unicode as far back as June 2015. The proposed method to implement this flag is as an Emoji ZWJ Sequence joining the 🏳 Waving White Flag and 🌈 Rainbow emojis together. Above: The documented sequence for the rainbow flag emoji. The implementation of this emoji as a ZWJ Sequence does not affect how it is seen by end users, with supported systems to show this alongside any other emoji. As with all Emoji ZWJ Sequences, vendors are free to implement this right away if they wish. "ZWJ sequences are not subject to approval by the UTC, because they do not add new characters". Basically: no approval needed from here. Vendors, go forth! If Emoji ZWJ Sequences don't require Unicode approval, why document this emoji at all? The primarily benefit of documenting this sequence is that it ensures consistency of implementation. Any of these would be just as valid, but of no use in ensuring cross-platform functionality. Above: Chosen sequence for the rainbow flag emoji. Technically nothing stops vendors implementing these flags today. 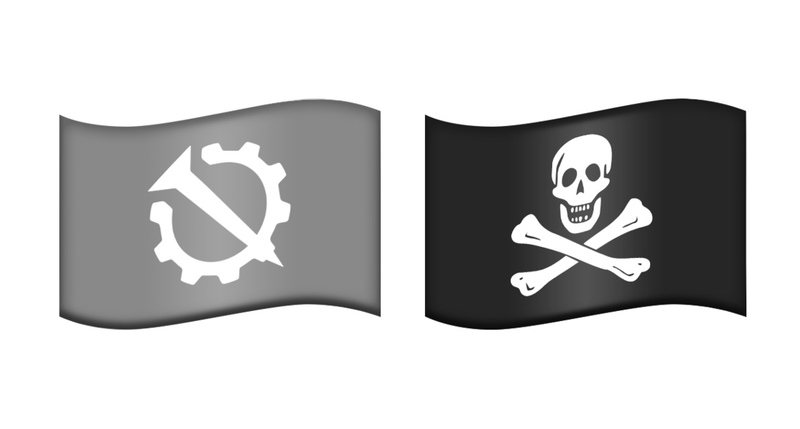 Above: Vendors could introduce these new emoji flags as Emoji ZWJ Sequences today. Having new Emoji ZWJ Sequences documented by Unicode is a way to ensure that if other vendors intended to introduce the same sequences, they would use the same emojis, in the same order. Basically, documentation = better cross-platform compatibility. Users could see this rainbow / pride flag emoji included by supporting vendors by the end of 2016. Note: despite being a flag, this has no relation to how other flags such as England, Scotland and Wales would be implemented, if approved. Source for header photo of rainbow flag. Rainbow flag emoji mockup is part of the Emojipedia Sample Image Collection.